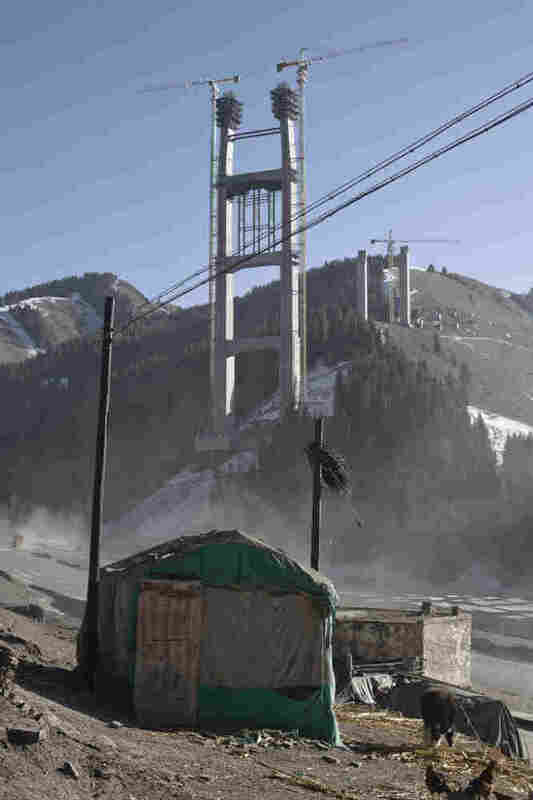 As China Invests, Many Kazakhs Say: Not Too Fast Having broken from its past as a Soviet republic, Kazakhstan is now a proud country with an up-and-coming economy and a desire to be a player on the world stage. Neighbor China seems to be offering what Kazakhstan wants: investment and political ties. But many worry about losing Kazakhstan's identity. NPR examines the many ways China is expanding its reach in the world. This month, NPR is examining the many ways China is expanding its reach in the world — through investments, infrastructure, military power and more. As China grows in power and influence, few countries are feeling the effects more than neighboring Kazakhstan. Having broken from its past as a Soviet republic, Kazakhstan now has an up-and-coming economy and a desire to be a player on the world stage. China seems to be offering just what Kazakhstan needs — billions of dollars in foreign investment and deeper political ties with real-world powers. But many people in Kazakhstan have a plea: not too fast. They fear China's ambitions and worry that Chinese influence could rob Kazakhstan of its identity — all but swallow up a country whose population is outnumbered by China's 80 to 1. "China is going to help us little by little," says Saule Amirova, a 61-year-old woman who lives in Kazakhstan's eastern city of Almaty. "And then, they'll own our land." The world is pondering whether to embrace China's economic power or fear it. And Kazakhstan offers a window into the potential benefits and costs of the decision. Many Americans may know Kazakhstan from the 2006 movie Borat. The film erroneously painted the country as a far-off land that produces foul-mouthed goofballs like the star of the movie. In fact, this is a diverse country, full of pride after emerging from a difficult past. For centuries, it was a barren, nomadic place. During Soviet times, Kazakhstan's intelligentsia was hounded by Stalin's regime, and many Kazakhs died fighting in the Red Army. Yet, Kazakhstan's people have long felt a deep connection to Russia, in language, culture and lifestyle. There is little emotional connection to China. Yet China has offered billions of dollars in loans to Kazakhstan. New money was announced earlier this year, when Kazakhstan's president, Nursultan Nazarbayev, went to China for three days and met with Chinese President Hu Jintao. China has agreed to build a new railroad across the country. China is helping to build an oil pipeline, and partnering in Kazakhstan's energy sector like never before. Tempers did flare early last year after Kazakhstan's president floated an idea to help the nation's economy: He suggested renting 2 1/2 million acres of farmland to China to grow food. People demonstrated in the streets, yelling that this relationship with China was getting too close. What's next, speakers cried out — will China force Kazakh people to eat with chopsticks? China's influence can certainly be felt in western Kazakhstan's Aktobe region, a place that looks and feels like Texas oil country. The flat brown and green landscape stretches for miles, with cattle grazing, trains occasionally passing and oil flowing. Western countries, Russia and China have long had interest in the oil here. But especially through the recent economic downturn, Chinese investment has been welcomed, and China appears to be the big player now. Through direct investments and tax dollars, China and its state-owned energy companies have invested $14 billion into the Aktobe region's economy. Chinese money now makes up somewhere between 30 percent and 50 percent of the entire regional budget. "They are maintaining our roads and doing the repairs," says Marat Balmukhanov, the director for industry and entrepreneurship in Aktobe's regional government. "They built a nursing home for war veterans. They bought computers for our schools. Every year, they buy 10 or 20 ambulances." It's hard to know any of this from walking around town. China's growing presence is all but hidden. The Chinese oil and gas companies employ mostly local citizens. 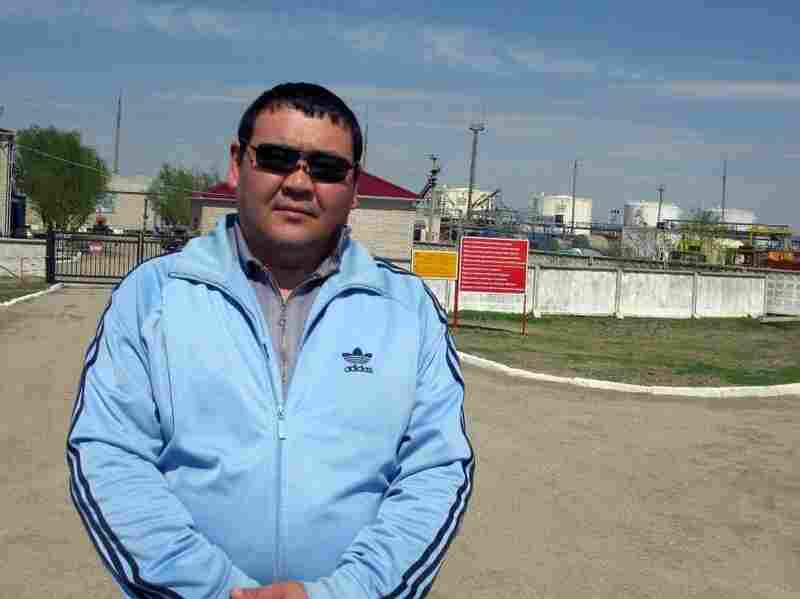 Nurlan Akhmetalin, a 38-year-old Kazakh, worked from 1996 to 2009 for the China National Petroleum Corp., the state-owned oil and gas company. He handled chemicals, drove a truck and for a while made good money. Eventually, he says, the culture in the workplace got to him. There was little regard for safety, he says, and bosses brought in from China had a demanding, aggressive style that people in Kazakhstan were not accustomed to. "We are losing our resources, and losing our independence," he says. "In the future, we'll have to rely on China. They'll give the orders here. Sure, they'll give us jobs and small salaries, maybe a bowl of rice. But we'll be working just like if we were in China." Scholars say China is desperate for energy — but, above all, influence. Nurlan Akhmetalin, 38, stands in front of a Chinese-owned oil processing facility near Aktobe, Kazakhstan. Now a cab driver, he worked for the China National Petroleum Corp. from 1996 to 2009. He made good money, but became less comfortable with how he says Chinese bosses treated employees and suspicious of China's intentions in his country. Adil Kaukenov, a political scientist who founded the Center for Chinese Studies at the Institute of World Economics and Politics in Kazakhstan, says China has been jealous of Russia and the U.S. for having political leverage across Central Asia. China became especially worried in 2001, when then-President George W. Bush began getting close to then-Russian President Vladimir Putin. Bush even said he looked into Putin's eyes and got a sense of his soul. "Bush looks in Vladimir Putin's eyes and sees something," Kaukenov recalls. Immediately, he says, China's alarm bells went off. China worried that the United States and Russia were becoming "very big friends" who were determined to beat terrorism in Central Asia. Like Russia and the U.S., China is deeply concerned about terrorism and instability in Central Asia. But when China looks into the region today, it sees the U.S. leading a war in Afghanistan. Elsewhere, it sees countries that turn to Russia — not China — for help when they face unrest. Kyrgyzstan was the perfect example last year, reaching out to Moscow in the midst of political unrest and ethnic violence. To gain leverage in Central Asia, China has tried to work through the Shanghai Cooperation Organization, which was established in 2001. China, Russia and countries in Central Asia are members and are supposed to cooperate on security. But Kaukenov says China's real strategy for gaining leverage with its neighbors, like Kazakhstan, begins with showing them the money. "It's the first target — security," he says. "Economics is [the] instrument to do security." Kazakhstan's political leaders talk about China with some trepidation, but with a sense that the economic benefits of a relationship outweigh any fears. Tanirbergen Berdongarov, a 35-year-old member of Parliament, supports his president's policies toward China. "The main goal in our economic policy is to have stability and good relations with the neighbors," he says. The U.S., Russia and China all want to partner with Kazakhstan economically, Berdongarov says, and all want Kazakhstan to be an "island of stability" in the region. It would be difficult, he says, for his country to close the door to any of those world powers. At the same time, Berdongarov has grown worried as he has watched Chinese goods flow across the border, even as Kazakhstan's own manufacturers have shut down. "[China is] a very big machine. For them to produce such a kind of shoes, T-shirts — it's very cheap and easy," he says. And that's all part of China's plan, he says. The more Kazakhstan's people rely on Chinese goods to live, the more pressure Kazakhstan's political leaders are under to maintain close ties with their neighbor. Berdongarov says China has reinvented foreign policy. "[It's] not like with the guns," he says. "It's with the shoes."